Last night at the NOW Lounge near Church & Shuter marked the first (hopefully, annual) Pride Slam, a Poetry Slam event done up with a proud little twist. For anyone that's been to a poetry slam before, you know that it can be a mixed bag of styles, and last night was no exception. Hosting the night's event was the immensely talented poet, actor, and playwright d'bi.young.anitafrika. She kicked off the night with several passionate readings that brought on huge applause from the crowd, and it only got better from there. Read on for photos (and video!) from the event. Ariana, crutches and all, performing alongside Krystle Mullin take the stage for a "Typical Day at the Races," which, unfortunately, I could totally relate to. 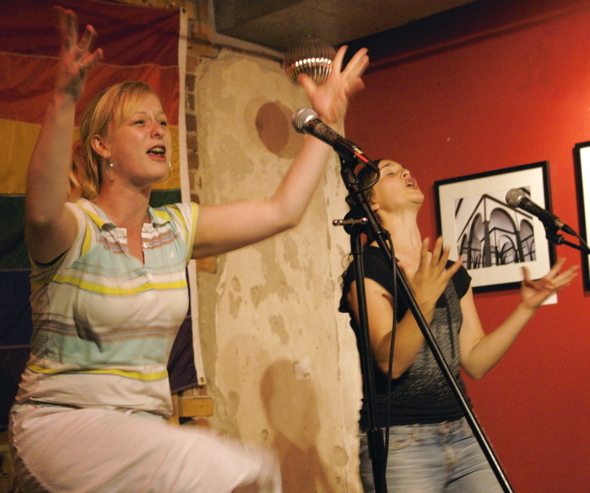 Amanda Hiebert and Krystle, of Last Call Poets give it their all. 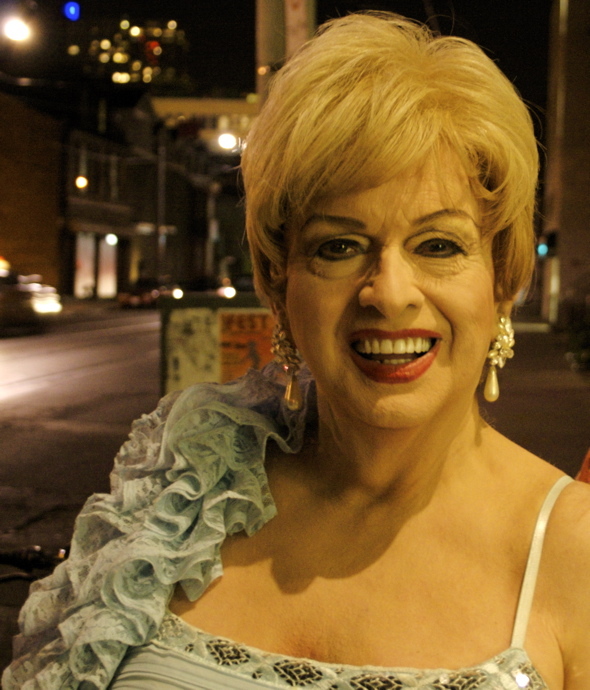 I ran into the truly unstoppable Michelle DuBarry, Grand Marshall of this year's Pride Parade, outside the Lounge during intermission. 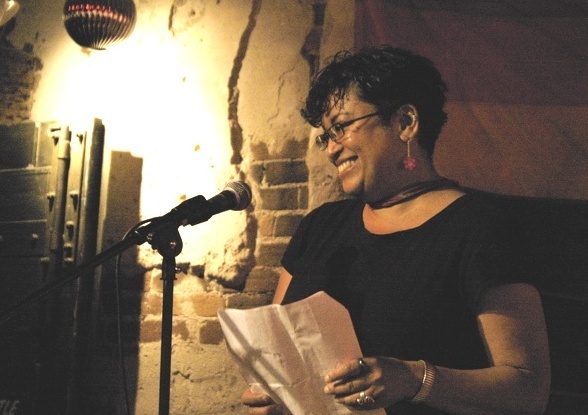 Later that night saw an open mic, where among a few others, Nalini Singh, who had read at the Drake just a few nights before, came out to show us what she was made of. It was a bit of an unusual kind of Slam in that there was no scoring from a panel of judges in the audience, as is usually the case. Though that didn't seem to bother any of the poets or the audience, who were all having a great time. Supposedly, the winner from the night will take home a cash prize and the chance to perform at Pride's Friday Yo Yo 'Mo party at the Labatt South Stage. 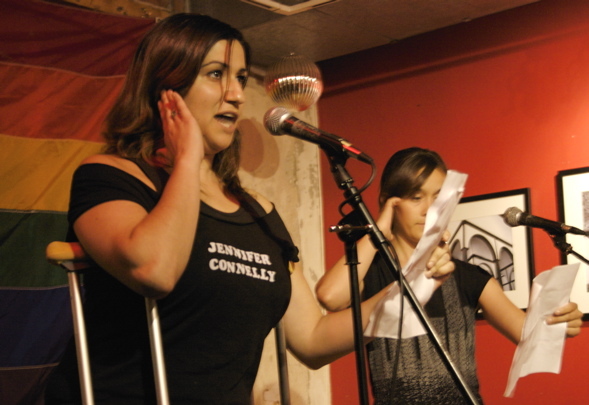 Many of the poets that performed at Pride Slam can also be seen at the many events that Toronto Poetry Slam puts together, which happen usually on a monthly basis.